We bring strong experienced thinking, and additional help and energy to the marketing efforts you may have underway. Projects and our services are “scoped “for what you need now. Great marketing partners can make a big difference in your team and your company’s success. Partnering with marketing consultants can be one of the important investments your company can make. 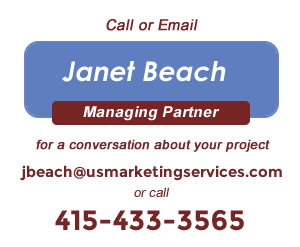 The best way to know that our marketing consulting services are the right for you is to talk with us about your challenges and goals. If we can contribute, great! If we are not right for what you need, we will recommend someone who might be better fit. You can have confidence you will gain a fresh perspective, benefit from our rigorous hard work and broad, deep expertise that since 1986 we have been providing to organizations like yours.